The Nichols store has evolved over the years. Check it out! 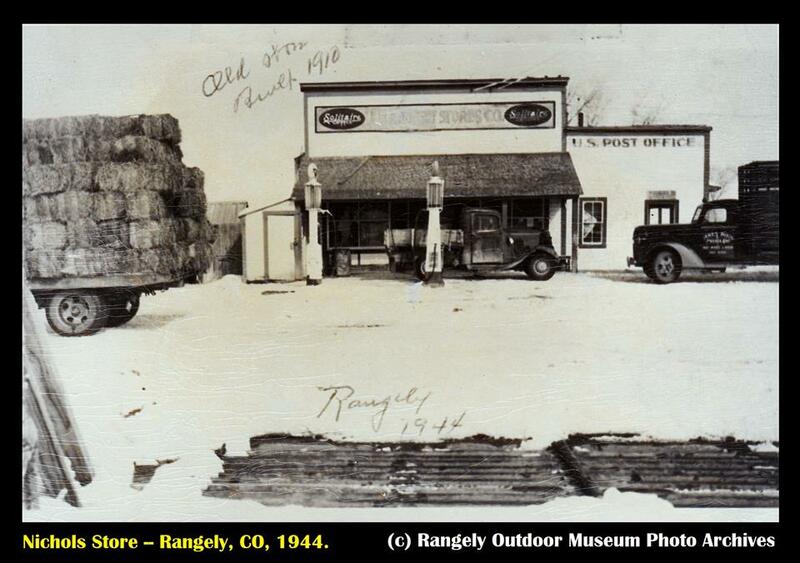 This is Nichol's store in 1944, from a photo shared from the Rangely Outdoor Museum Archives. It had gas pumps (the old kind, where you pumped the gas from the underground storage up into the glass area of the pump first, and then drained that amount into your car), a post office, and served as a Trading Post and General Store. At this time, the building (which the note on the photo states was constructed in 1910) was located on the NORTH side of east Main Street, where it pretty much WAS the downtown of the settlement that would become Rangely until being moved across the street to its present location. Here is the "new" Nichols store on the south side of the street, across East Main from the former building. The old-style Conoco gas pumps remain (you first pumped the amount of gas you intended to buy up into the glass area at the top of the pump, and then drained it from there into your car). Meats Groceries, Fruits and Vegetables were on sale inside, according to the big sign on the front ofthe building. ("Nichols Fruits and Groceries" proclaims the white side on the side). Judging by the design of the car parked out front, this photo was most likely taken in the boom years, the later '40's sometime. (c) Rangely Outdoor Museum Photo Archives. 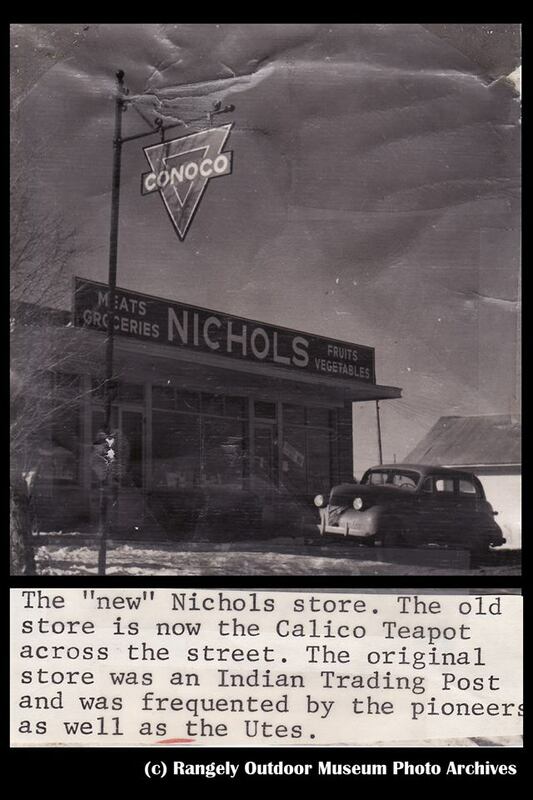 The caption claims the old store across the street had now become a business called the "Calico Teapot". In Oil Geek's day (the 1960's), Nichols was a full-service grocery store, with Bestway (further west, also on Main Street) the other place in town to get groceries. There were no mini-marts or convenience stores in those days -- gas stations had "service bays" in place of them, and many gas stations worked on car repairs as well as pumped gas and changed oil. Fred Nichols himself was still living, elderly -- but could be occasionally seen dropping by the store or even helping customers therein, as I remember.